Because it had borrowed the Spectrum analyzer from Rade Schwarz Japan Ltd. to measure outputting waveform of AM wireless mike, was used after a long time. 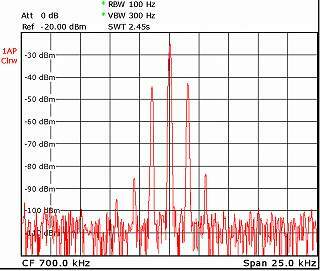 What is the Spectrum analyzer ? It is a measuring instrument that can see the frequency element to be brief. It is called a spectrum analyzer. 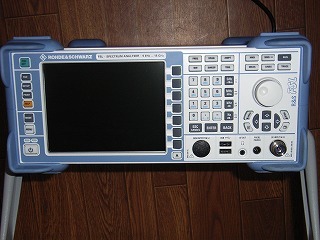 This photograph is Spectrum analyzer FSL18 borrows from Rade Schwarz Japan Ltd. through the CQ publisher. It is not like being able to buy it privately very much because it is the expensive one. WidowsXP stands up when switching on, and this is a computer. It is not when trying though it is likely to be able to use with the mouse if the mouse is put up. It operated it with a right cursor. The frequency counter: It is < 50ms in resolution 0.1Hz. A central frequency of the horizontal axis is decided. The spectrum space of the span is decided. At this time, the frequency in the left end is made to become to 0 or the plus. The setting that the frequency in the left end is subtracted is disregarded. The measured signal is connected with the input terminal. It is especially noted that as for the input impedance in the measuring terminal, there are a lot of one of 50 OHM in a high frequency in which the impedance match should be taken. It is easy to adjust the attenuator of a vertical axis and to see. It sets it responding for RBW(Resolution Band Width) (bandwidth of the IF filter of the Spectrum analyzer). I want to do the design production AM and the one that the output of a wireless mike was measured with the Spectrum analyzer is this shape of waves. It is the one that AM wireless mike was modulated by about 25% in the sine wave of 1.5kHz. The level of about the second side-band wave of the plus or minus 700kHz three kHz is about -40 a dB compared with the level of the first upper and lower side-band wave. I think this to be the one by the linearity of the modulation of the AM modulator and the one by residual FM the modulation element. However, there is no problem It is 1/100(Correspond to the distortion by 1%), and is an electric power, and because it is a voltage and 1/10,000 if it is -40 a dB. It is the very difficult generally one that makes to 1% or less at the distortion rate of the synthesis of the AM modulation. The electric power and the voltage of the transmitter pulse of the wireless machine and the transmitter are measured and spurious of that is measured. Local sending signal strength such as receivers and spurious of that are measured. It also uses it to measure electric field strength of the electric wave. It also uses it to measure unnecessary radiation strength of an electronic equipment. The input terminal is usually N type connector, and has the one that it is 50 OHM and is the impedance of unusually 75 OHM.